The following Sunday I was in church listening to a preacher struggle at making sense out of this terrible loss of life. He was clearly moved by Arthur’s cruel and untimely death. His deep compassion spoke volumes even though we were left with less than an explanation for what still seems for all the world like a random, violent and meaningless act of nature. I have long since concluded that tragedies like these have only as much meaning as we can give them. We give meaning to lives lost in war by striving for peace. We give meaning to lives lost to cancer by dedicating ourselves to finding treatments for the disease. We give meaning to lives crushed under the wheel of oppression by striving for a more just and peaceful world. 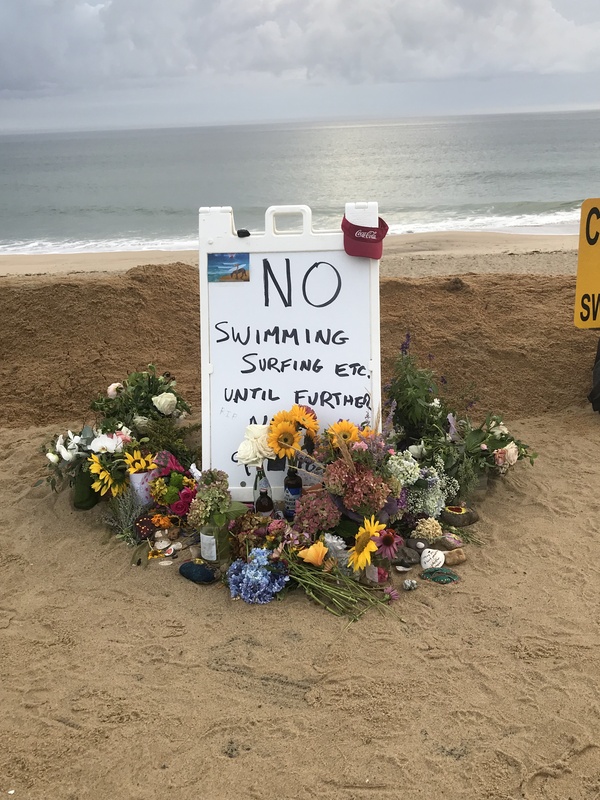 So how do we give meaning to the life of Arthur Medicia, a young man killed while out enjoying the ocean waves with his family? I can appreciate the psalmist’s sense of wonder and awe. When you stand on the ocean shore, you can’t help being overcome with the beauty and grandeur of this planet with its manifold living and non-living forces. The ocean is indeed filled with marvelous creatures, but these include the sea monster, Leviathan. Just as C.S. Lewis reminds us that God is not a “tame lion,” so the psalmist would have us know that the world God made is not a safe playground. Those of you who happen to be of my vintage know what I am talking about. For you youngsters, I am referring to playgrounds with which you are familiar and perhaps the only ones you have ever known. They were all built since the 1990s. They are paved with soft, rubbery padding and equipped with cushioned playthings designed to prevent injury. You won’t get hurt in these play areas, but if you are over six, you probably won’t have much fun there either. By fun I mean the sensation of rocketing into the sky on a wooden slab swing and the thrill that comes with coming face to face with the sky for just an instant before falling back to earth. I am talking about the merry-go-rounds that the strongest and fastest among us would crank up to warp speed while the rest of us clung for dear life against the pull of centripetal force. There were more skinned knees and elbows back then. Occasionally we broke bones. Rarely, but tragically, we saw some serious injuries. But maybe that’s the cost of having fun, of living fully in this marvelous world, of playing in the vast oceans where Leviathan and the great white sharks sport. This Monday morning my daily bike ride took me on a turn down to Newcomb Hollow Beach. At the end of the parking lot was a sign posted by the township announcing the closure of the shore to swimming and surfing until further notice. Surrounding that sign were bouquets of flowers and shell arrangements memorializing Arthur Medici. Down in the water I could see about half a dozen surfers taking advantage of the high surf in seeming defiance of the sign’s injunction. Foolhardy? No more so than me when I hop on my bike to negotiate the narrow, curvy and shoulderless highways of the outer Cape. I am aware that cars kill far more cyclists than sharks do swimmers. Still, I ride. I love the sea wind in my face and the scent of the ocean. I love the exhilaration of cresting a hill and coasting down the other side. I love the subtle sights and sounds of the national forest that you miss when you travel through it in a cage of steel and glass. Like those surfers, like Arthur Medici, I believe that life, however short or long it might turn out to be, is far too precious to spend in a safe playground. So I will honor and give meaning to the life of Arthur Medici by fully celebrating and living in God’s beautiful, mysterious and terrifying universe-Leviathan and all. Whitehead, Alfred North, Process and Reality (c. 1978 The Free Press, NY) p. 338. I feel compelled to put this incident in some sort of context. This event was the Cape’s first shark fatality since the 1930s. Shark attacks are rare in these parts for a couple of reasons. First, understand that white sharks typically do not attack human beings intentionally. On those occasions when they do attack, it is usually because they mistake us for something else. A surfer in a black wet suit looks a lot like a seal to a hungry shark. You reduce your chances of encountering a shark substantially by staying away from seals and avoiding the water at dawn and dusk. Second, during the official holiday season, the beaches are under the watchful eye of lifeguards who are trained in emergency medicine as well as water rescues. They are skilled at spotting rip currents and detecting the approach of marine life dangerous to swimmers, including sharks. The life guards are in radio contact with the Atlantic White Shark Conservancy which studies and monitors shark activity. That does not preclude the possibility that a white shark might slip through undetected into swimming areas and attack swimmers as happened earlier this year in the neighboring town of Touro. But your chances of suffering harm from a shark are exceedingly small. After Labor Day, the beaches are unmonitored and swimmers are essentially on their own. Because cell phone reception is poor to non-existent on the beach, anyone spotting a swimmer in distress would need to run back to the point of beach entry and climb up the substantial incline to the parking lot in order to call for help. Even so, rip currents and hypothermia are far more likely to take you out than a shark. Predictably, this tragedy has inspired the usual upsurge in shark hysteria and calls for the elimination of great white sharks from the Cape or the seals drawing them to our shores. This, in my view, amounts to little more than creating a “safe playground” on a grander scale. Though I am no marine biologist, I can still say that, from a biblical standpoint, altering the ecosystem of the Cape for no better reason than eliminating what we know to be a slight risk to some vacationers constitutes an act of profound homocentric arrogance.